Stacy and Nick were a very special couple. Stacy is the daughter of my Wedding Assistant, Dianne. I have known this family for over 20 years and I love them dearly. I took Stacy to school when she was in kindergarten and now she and her new husband are both attorneys. It was great fun planning with all of them and watching all of Stacy and Nicks wedding dreams come true. A true blessing to have planned their wedding! More pictures to come. What a fun day for high school sweethearts, Megan and Shayne at Bear Creek Ranch. It was a HOT day for an outdoor wedding, but it didn't stop the guests from watching the sweet ceremony and dancing the evening away. It was a perfect day! Katie and Matt had a perfect day surrounded by all of their family and friends. You knew they were in love the first time you saw them together. Pastel pinks, lace, lace, lace, sweet ceremony at University Park UMC and a band to rock the night away made it a perfect day! Melissa and Andrew had a beautiful day which included their family, the weather, decor and their hearts for the Lord. Venue - The Milestone Mansion and Barn in Aubrey, Floral - Coco Fleur Events, Band - High Definition, Photography - Aves Photographic Design, Lighting - Simply Music Events, Hair and Makeup - Kiss and Makeup, Cake - Candy Haven. Melissa paid a lot of attention to the details she wanted and they were reflected in every party of their perfect day! Wendy and Kevin's day was a quickly planned wedding. Engaged in September, venue booked in October and married December 12th. Such a beautiful couple with exact ideas in mind, which made it easy. All the vendors were available and accommodating on such short notice. It was such a blessing to help this family plan their perfect day! Alyssa and Junji chose a fun site for their wedding and reception. The Dallas World Aquarium offers fun for the guests during cocktail hour to tour the aquarium and have drinks and appetizers along the way. The ceremony was beautifully draped by Blissful Celebrations along with the floral and manzanita trees for the reception. Personal floral was provided by Gathered: Floral Design and Events. Photography by Angela Fleming at New Seasons Photography and the yummy cakes were provided by Nothing Bundt Cakes in Dallas. I have known Alyssa and her family for many years and it was a blessing to help make their day at the Aquarium and "perfect day!" Lisa and Richard chose St. Mary's Catholic Church in Dallas to begin their perfect day, followed by a reception in the Grove at Marie Gabrielle. It was a beautiful palette of peach, pink and ivory. The garden was filled with candles and floral provided by Luxe Petals. Gorgeous string lighting provided by Simply Music Events. The giant chocolate chip shell filled with cookies and brownies, and an insanely fabulous cake provided by Panini Cakes with the over the top floral placed by the bakery. Photography provided by Convey Photography. Aaron Kannowski of Uptown Sounds kept the dance floor provided by DFW Dance Floors, hopping! Such a fun evening for everyone! Bernice and Tony chose a hot summer day at the end of July at the beautiful garden venue, Marie Gabrielle in Dallas. The garden was the perfect backdrop for their ceremony surrounded by family and friends. Bernice's perfect fitting gown was purchased at Lewisville Bridal Boutique. The yummy Lemon Deborge cake was from Del Friscos (a favorite dessert of their's) along Sprinkles cupcakes. Linens were brought to us by S.E.A.T. by Design and these amazing photographs were taken by Matt McElligott Photography. I had the blessing of being referred to Bernice and Tony through Sarah Burke at Gathered: Floral Design and Events. I planned Sarah's wedding back many years ago when I first got started i the planning business. She has become an amazing floral designer with such a heart for God and her family. This wedding was beautiful love story and I was blessed to plan their Perfect day! Kathryn and Kyle were married at the beautiful Royal Lane Baptist Church. I was blessed to get to know this family well. 4 weeks before I planned Jessica and Windor's (brother of the bride) wedding below. Beautiful corals and blues. Photography by the talented Jojo Pangilnan Photography. Stunning floral by RLove Floral. Dress purchased at LuLu's. Reception held at the Royal Oaks Country Club. Yummy cake baked by the talented Jenny Layne Bakery. The awesome band that rocked the night was Signed, Sealed, Delivered. Windsor and Jessica were a beautiful couple. The bride looks like a model out of a photo shoot, but she is stunning! Thank you to Cottonwood Road Photography for these amazing photos. I just couldn't decide they were all so pretty! 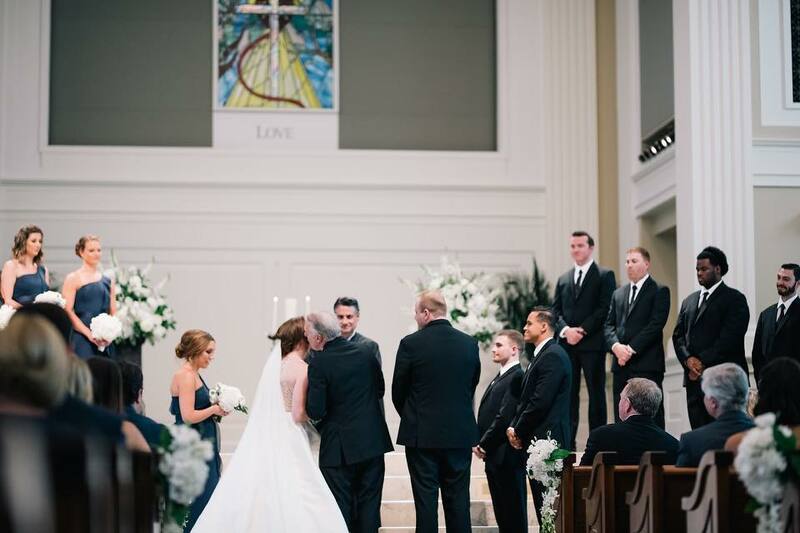 The sweet ceremony was held at First UMC McKinney with the reception following at LaCour Venue. It is like a little French villa out in the trees. Flowers provided by Taylor Davis of Something Pretty Floral, Lines by SEAT by Design, Cake by Sweet Art Bakery, Entertainment and lighting by Aaron at Uptown Sound, Makeup by Wendy Zurrudo and Transportation by Premier Transportation. Erin and Taylor had a cold and windy December day to celebrate their perfect day at the Venue at Waterstone. They were surrounded by 300 of their favorite friends and family and danced the night away to Trey and the Tritones. Beautiful photography by Kate Newman of Kate Love Photography The gorgeous floral and ballroom flip was provided by the amazing Lisa Stiles of Coco Fleur Events, linens by LaTavola and the sweets by a variety of bakers. Catering of fajitas by Cristina's Mexican Food. Such a sweet couple with an amazing love of the Lord! Kristen and Eric were married at the amazing Perkins Chapel at SMU. Their fun and beautiful reception was held at the Four Seasons Resort in the Pavilion. Photography provided by Daisy Photography. Gorgeous floral provided by The Garden Gate. Lovely Lighting by DFW Draping and Lighting and cake provided by the talented Fancy Cakes by Lauren. The fun and awesome music was provided by The Party Machine. Her beautiful dress was purchased at the Bridal Boutique of Lewisville and makeup by Lashes and Lace. Rachel and Harris tied the knot at the beautiful Perkins Chapel at SMU. They followed their ceremony with a fun reception at the Northwood Club. Photography by the sweet Mary Fields Photography. Floral galore in pretty shades of white and ivory designed by Something Pretty Floral. Cake/Panini Cakes. Band/Walton Stout Band.